According to http://turul.info/, the mythical Turul bird is one of the most important symbols of the Hungarians. The Turul is seen as the ancestor of Attila and is often depicted carrying the flaming Sword of God. The legend of Emese, who was the descendant of King Atilla and wife of Ügyek, once had a dream. As the Turul bird appeared in her dream, a crystal-clear stream started to flow from her. As the water flowed, it grew into a mighty river. It was thought that the dream represented her symbolic impregnation by the Turul, and it meant that she would give birth to a line of great rulers. Emese found out shortly after the dream that she was pregnant. She gave birth to Álmos, who was the father of Árpád, the great leader of the Magyars and founder of Hungary. This legend reaffirms the Hun-Magyar kinship and the knowledge that the Magyars re-conquered Hungary as their rightful inheritance from Atilla's great Hun Empire. In my fantasy series, The Ancestors' Secrets, I weaved my favorite legends and bits of historical facts into the story, that plays out in the present and past, with intriguing tribal secrets, magical heritage, love triangle, and an exciting and dangerous life in a secret society. I love this beautiful video about the ancient beliefs, the mythology of the World Tree. It also mentions Attila the Hun and the Turul bird that carries the Sword of God. The statues had been in my family for centuries, they were small and had a deep, warm brown color. The rich, shiny brown hue came from the hot herbal tea Elza poured over the statues every morning, as my ancestors had done for generations. Beside the statues was an ancient, dark leather-bound book. Its permanent place was on the Prayer table, and every Hun family had one. I had leafed through our book many times. The first few pages remained empty to me, but the rest of the book contained my ancestor’s names and achievements, written in ancient handwriting. Mom had said when I asked her about the empty pages, “The Book will reveal all its secrets to you, but only when you when you reach the age of maturity.” I wondered if I were ready; I was entering into Hun adulthood after all, so I made a mental note to check the book the next day, after prayer time. I was still a little angry with Elza for not letting me read her feelings. She was murmuring under her breath, as she did every morning. It was a low, rhythmic humming sound, but I did recognize some of the ancient Hun words. She refused to give me an explanation whenever I asked her about it, but I’d seen her doing the strange whispering, at Morning Prayer, ever since she came to live with us. I turned and saw Joland collapsing on the ground in agony. He held his head with both hands, screaming in pain. I didn’t understand what was happening to him. He didn’t appear to be injured. I watched Joland wiggling on the ground and then he went still. I thought he was dead, but then he moved. “Curse you. I curse you all,” he shouted. He looked back with a murderous look in his eyes, “What? You defeated me, and I’m nothing but a broken man. I won’t stand your gloating.” He turned. He gave me a long and hard look, and then the fierce look on his face slowly softened. Tears filled his eyes and rolled down his face. He knelt before me, “Then I’m your servant,” he said. Mundzuk drew his sword and took a step toward Joland, “You can’t trust him,” he said with a sneer. A sudden bright light poured down from the ceiling of the cave. A 3D picture appeared before us. It seemed so real. The sacred Turul with a flaming sword descended slowly and hovered over us. “Ilona!” I heard Elza’s voice, “There is a mark of the sword etched into your skin, and your Royal mark has changed.” She reached into her pocket handed me a makeup compact with a small mirror. I saw the sign of the Queen on my face. Mundzuk kneeled, “My Queen.” He said, and the others followed. I looked around frantically and saw everyone kneeling and offering their service and life to me. The kneeling people around me had the expressions of devotion and submission on their faces. Bela knelt with the others and looked up at me with devotion, deep pain, and acceptance in his eyes. 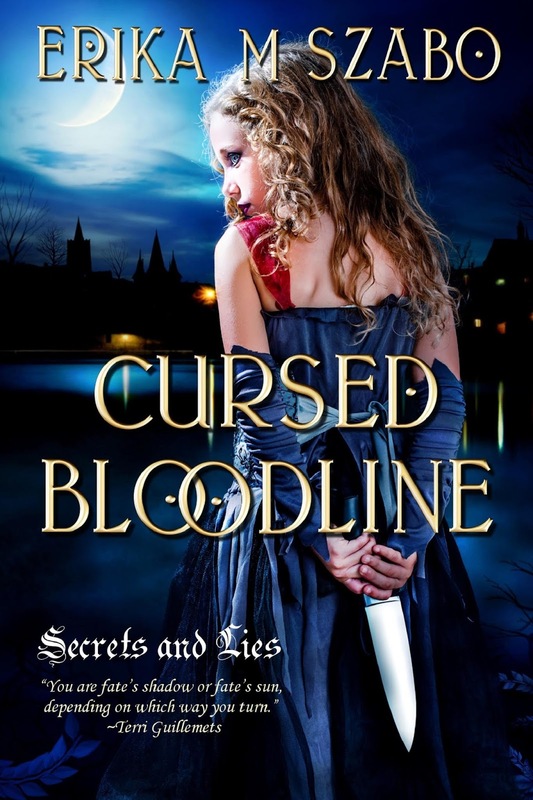 This suspense fantasy takes the reader back to the life of people in ancient times. A romantic suspense novella. Dark family secrets separated Emily and Daniel when they were teenagers, but fate brought them together again. Jayden, Emily’s brother, finds a leather book in his grandmother's secret room that was written in 426 by a shaman. 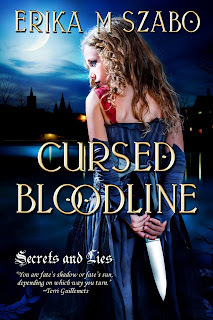 Emily can read the ancient runes and finds out that if the family curse remains unbroken, it will bring ruin their lives as it destroyed many of their ancestors' lives for centuries. Can they find the way to break the ancient curse? Could Emily find happiness with her childhood puppy love, Daniel? 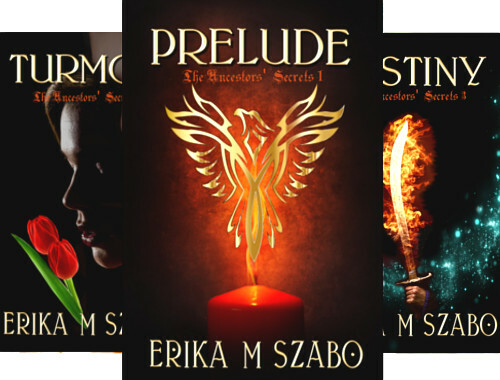 "Szabo expertly weaves this story through both today's timeline and that of yesterday's and brings us out on the other side with an amazing ending." I love all things mythological, what a fascinating post, Erika. Great excepts too! I love Mythology but I was not familiar with this tale. Very nice and great video. Great stuff, and a very engaging sample from each of your series books. Consider them added to my tottering reading queue. They read like captivating storytelling. And considering how well you do everything else in your publishing experience, I have no doubt that they won't disappoint. As someone who also enjoys mythology, I really enjoyed this article and your excerpts. I was not familiar with the Turul bird. Thank you for writing this! Erika is a most talented author. I've read a few of her books and was able to get transported to another place in time. Yes, she has the ability to take her readers there. +Erika M Szabo You're very welcome! Author and illustrator Erika M. Szabo​ is featured today on A Small Gang of Authors, where she talks about Hungarian mythology, which is so integral to her fantasy novels, the Turul bird, and Attila the Hun. She also provides us with a very cool video about the infernal Underworld of Hungarian mythology, as well as excerpts from her novels. Thank you for sharing my post Joe! All countries have legends from the past, the Hun legends unknown to many including me. It was interesting to learn that Attila carried the Flaming Sword of God into battle sweeping all before him. Better still was the details of The World Tree, with the Gods, the Moon and the Sun inhabiting the Upper Tree, whilst humans and mystical beings lived in the Middle Tree. The Lower Tree was the domain of bad souls and evil spirits. An educational post all round. As lover of mythology who often draws up it for inspiration in my own work, I found this a fascinating article, especially since I had never heard of the Turul bird until today. It's relationship to Attila is something I need to explore in more detail. That cool video has stirred some ideas for a series I wrote for, Heroes in Hell. Thanks so much for posting this, Erika.